Gwendolyn lost 58 pounds. She wants women with chronic knee issues to know that there is hope. Seeing her parents face major health issues was part of her motivation. As she approached her 50th birthday, she knew that she wanted to make some changes. Check out her story. I writing to tell my story. I want women with chronic knee issues, like me, to keep it moving. I am the primary care guardian of my Dad and also have a sick Mother. I realized that I was headed for the same fate if I didn’t do something about my eating habits and weight loss. My Mom suffers from AFIB, an irregular heart beat and lung disease. She also has high blood pressure and high cholesterol. My Dad has diabetes, high blood pressure and high cholesterol. I knew with my 50th birthday approaching that things had to change. I started off wanting to do the Gastric Sleeve Surgery. I even went through the entire process and was approved. However, I had to have a talk with myself. I had to ask myself: Did I really try to be honest with my weight loss journey? Am I really ready to make that mental change needed to stick to it? I said YES. I started my weight loss journey in December 2015 after cancelling my weight loss surgery. I began eating more greens leafy veggies and making any kind of smoothie I could think of. Cut all the way back from white sugars, bread, rice and fatty meats. I try my best to eat only chicken, turkey and fish that is baked, broiled or grilled. It is a challenge, but I am worth it. My starting weight was 289 pounds and now I weigh 231 pounds, with 70 more pounds to go. I’m 5’4″ tall. I have a way to go but I am not looking back. I have struggled with forming a workout routine. I try to walk at least 30 minutes on my lunch break every day. I also joined the gym where I am presently using the stationary bike which is better on my knees and I’m getting into weight training. I try to just keep it moving one day at a time. My advice for others is to always be true to yourself because at the end of the day, it is all mental over everything else. It really is Mind over Matter. Just tell yourself you are worthy and love yourself through the ups and downs, because it is a lifetime journey of choices. PS: I am presently at a Plateau and need to get rev’d up again. I need some help from people who are going down the same path as I am. 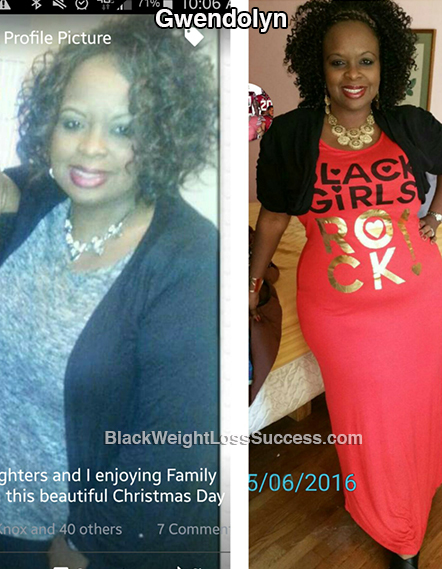 Would love to find a support partner through Black Women Losing Weight. Hi Geendolyn thank you for sharing your story! It’s is very inspirational. Are you still looking for a partner?